NORMAN — The University of Oklahoma is getting in the boat business. Culminating a quest to add another women's sport, OU on Thursday revealed plans to form a women's rowing team, possibly competing as soon as the 2008-09 school year. School officials considered several women's sports, deciding on rowing in part because of the emergence of the Oklahoma River project, which provides a home for the newest Sooners squad. "We spent a considerable amount of time, involved a lot of people in evaluating the various sports we could sponsor,” said OU athletic director Joe Castiglione. "This one made the most sense. Adding impetus to the move were Oklahoma City businessmen Clay Bennett and Aubrey McClendon, who worked with OU and the Riverfront Redevelopment Authority in adding the sport. Both were also involved in private fund-raising for a new boathouse to be built on the banks of the Oklahoma River. McClendon made a lead gift of $1 million toward the project, and a group of private donors led by Bennett will provide another $1 million. A matching $2 million in OU athletics department bonds will be used in completing what will be a $4 million facility. While the university has been fully Title IX compliant, Castiglione said this presents an opportunity for OU to enhance the school's own gender equity plan. Eventually, the addition of rowing will result in the addition of 20 women's scholarships. And because the sport is what is termed an equivalency sport — meaning scholarships can be split — the roster size is expected to be considerably larger. In the Big 12, Texas, Kansas and Kansas State sponsor women's rowing, making for natural and geographical rivals. Castiglione said that the locale, along with the facility, could make Oklahoma City a popular destination. Castiglione said the next step is hiring a coach, then putting in place a plan to compete. "It will be something to see the Sooner flag flying prominently over the Oklahoma River,” said OU president David Boren. Would the team want to drive all the way down to OKC to practice every day? It's less than 20 miles from the OU campus to the OK River. I suspect the team won't row every day and will have rowing machines and other equipment to help them train on campus. BTW, to put the $4 million for the boathouse in perspective, that's more than was spent on the one sponsored by Chesapeake. So even allowing for inflation, this should be an impressive structure and an important addition to the river. OU already has "club" crew, and has had a rowing team for at least the past 2 years that I know of. And yes, they already commute from Norman and meet on the river most days at 5am or so for practice. I hear its really intense, but the people I know who participate love it! 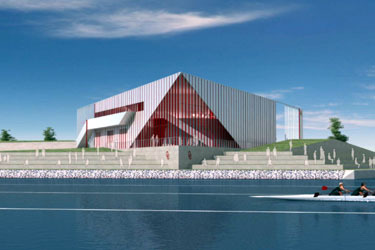 Sorry, I was referring to Cuatro's suggestion of an OSU boathouse. Incidently, I just received a copy of Architectural Record (THE national publication for architecture) just 5 minutes ago and there is a 6 page article on Rand's Chesapeake boathouse. I love Architectural Record and used to subscribe to it, even though I'm not anything close to an architect. Yea...I read that article. I'm a subscriber to Metropolis as well as a big fan of the mag. I do like Archrecord, but I like Metropolis' comprehensive coverage of not just architecture, but design of all kinds. It's just awesome to see Oklahoma City and an Oklahoma native's fabulous design published in an article that is read by folks worldwide. Don't look know, but OKC is movin' up! Bedlam Battleship. Much more entertaining. This is great news ... and, yes, Bedlam Battleship does sound engaging, venture79! Isn't OCU building a new boathouse as well? So there could potentially be three boathouses along the river: the Chesapeake, OCU, and OU? That sounds pretty cool. And OSU is probably too far from OKC to have a boathouse, they might actually be closer to the Arkansas in Tulsa where TU has their rowing team. I believe that OSU has a club crew team... at least they did my feshman year in 2001. They practice at Lake Carl Blackwell, but if all of the big rowing comps are on the Oklahoma River, I could see them building a boathouse there if they ever create an NCAA team. That sure would be a long drive to practice. I hope the OU and OCU Boathouses get built next to the Chesapeake boathouse. We could create a "Boathouse Row" just like they do on the east coast in Philly on the Schuylkill or in Boston or Baltimore. If you look at the calendar at the CHK Boathouse site, you'll see both OU and OCU currently use that facility every day. Are we sure OCU is going to build a boathouse? Perhaps they'll continue to use the CHK one and OU's will be for their exclusive use. I was implying that OSU would continue to practice at Carl Blackwell, but build a boathouse on the River for competitions. I do not know of any plans to add women's crew at OSU. I am just presupposing that if they ever did and the Oklahoma River was the center of the Oklahoma rowing scene, they might build a boathouse there. It seems like a waste to build a boathouse you only use a couple days a year. Yea...and a $165 million stadium you only use 6 or 7 times. Football gets a bit of special treatment around here though. Rowing--not so much. 165M to Boone Pickens...chump change. Having a stadium named in your honor...priceless. 4M to Boone Pickens...drop in the bucket. Expanding your name to a boathouse on the Oklahoma River, for 40 times less than the football stadium...again, priceless. OSU doesn't have to be the only one using the boathouse. This would be a good investment if you ask me. I don't think it will happen though. If you look at the CHK Boathouse schedule, you'll see that OSU's club team does use it. Maybe OU will share their facility with OCU (or others) to off-set some of their costs? That would in turn free up the CHK for others. In any event, with at least the CHK and OU facilities, that is enough to bring a critical mass of activity and events to that area. And things are bound to grow even more from there. There will be a "boathouse row" east of Byers Bridge. It will consist of at least OCU and OU. Also, a boathouse is not just used a couple of times a year. They are used all the time. In winter, they can switch to weight training, the rowing machines or an indoor rowing pool, which I believe one of them will have. OCU also announced awhile back they are going to have a sculling program. If I remember correctly, this will be the only sculling program in the country. Also, a boathouse is not just used a couple of times a year. I said that in regards to the idea of OSU having one that they would only use when they competing in OKC. OKC or TULSA? Which Metro Has The Most Long-Term Growth Potential?